THE FLASH REVIEW: Season 2 Premiere "The Man Who Saved Central City"
Television's best superhero show finally returned Tuesday night as CW's 'The Flash' began season two after a triumphant rookie season. All seemed well as Barry fought Captain Cold and Heat Wave with some help from Firestorm. Afterward, the congratulatory pats on the back appeared a little too idyllic and we realize as soon as Eddie Thawne and Harrison Wells are on screen something is amiss. Cut to Barry alone at an empty dark STAR Labs snapping out of this dream sequence. It's been six months since the singularity and nothing is as it once was. The truth is Team Flash is now disbanded and gone separate ways. Barry doesn't want to put anyone in danger any longer leaving the team to find new gigs. Cisco is part of Joe West's Anti-Metahuman Task Force to the chagrin of Lieutenant Singh. Pairing Cisco and Joe has made them a great buddy cop duo even though one of them doesn't wear a badge. Sorry Cisco. Unable to work amid the memories of Ronnie, Caitlin Snow now works for rival Mercury Labs. Ronnie, as it turns out, helped Barry close up the singularity by merging the event horizons leading to a huge explosion. It separated Dr. Stein and Ronnie leaving Ronnie presumed dead. "The Man Who Saved Central City" was really more than one man. To the citizens and the Mayor of Central City they only recognize The Flash as their savior and hold a big Key to the City ceremony. Barry begrudgingly attends but is interrupted by Bane. Oh sorry, that wasn't Bane as my daughter surmised, but one supposedly dead nuclear plant worker named Al Rothstein. Later in the episode dubbed Atom Smasher by Dr. Stein of all people, he goes after The Flash at the rally. He makes himself a giant by drawing in the radiation around him and is nearly invincible. The arrival of the Atom Smasher much like the opening of the wormhole from last season opens the possibility of an alternate universe where our newest villain was sent from. It's also the same place Jay Garrick and his famous helmet came from. He shows up at the end to give the team a dire warning,"your world is in danger." But first, the team has to reassemble and fight Atom Smasher putting all their resources together like they had all last season solidifying the need to remain a team. Despite the moping and resistance to keeping anyone close in order to keep them safe, Barry realizes they're stronger together than apart. It's also a nice way to close out loose ends from last season as new threats begin to emerge this season. Garrick's warning aside, Atom Smasher's last words after finally being defeated revealed he was sent by Zoom to destroy Barry. After ignoring letters sent from Well's lawyers one of them pays Barry a visit and explains that STAR Labs was left to him but must view a recorded message first. Wells gives Barry what he always wanted - a confession. He admits to killing his mother but warns that despite what may come from it, he won't be completely happy. Barry's dad, Henry, is released from jail and finally reunited. What should be a major turning point for Barry becomes an extremely odd turnaround by Henry. A jubilant "Welcome Home" party for Henry is undercut by his shocking and incredulous admission to Barry that he's taking off. Barry spends 15 years trying to exonerate his father for wrongfully being convicted of killing his mother and the minute he's freed he basically tells him "thanks, son but I'm going to let you be you and I'm going to jet." In an otherwise solid emotional episode that sets the table for the rest of the season, this twist was the least believable. I'd sooner believe a man could harness radiation to transform into a giant than Henry's decision to leave his son after being incarcerated for 15 years. Despite that doozy of a revelation, having Barry and the gang back is a welcomed sight. And thank goodness they addressed the lack of security of STAR Labs. 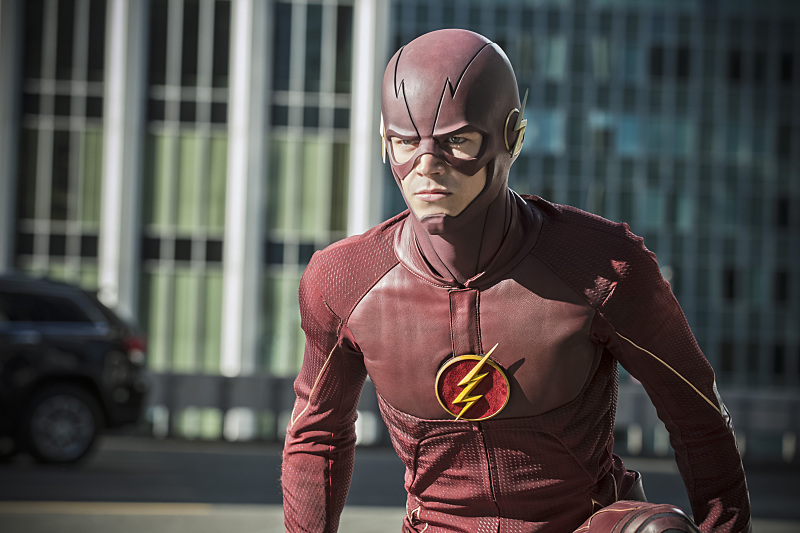 'The Flash' still sizzles with warmth, humor, and amazing action. Based on previews of the next episode 'Flash of Two Worlds' the fun is just starting.